On Sale Now! Save 3% on the Copystars smart 1-5 sata CD/DVD duplicator controller 128mb buffer by Copystars at Riot Recordings. MPN: Copystars-AT2d4. Hurry! Limited time offer. Offer valid only while supplies last. 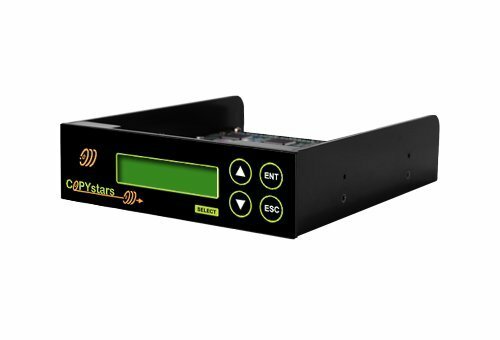 Copystars Sata /DVD/CD duplication controller supports E DL, DVD+/-R, DVD+/-RW, DVD RAM, DVD+/-R Dual Layer, CD-R, CD-RW blank media standards. Copystars Sata /DVD/CD duplication controller supports E DL, DVD+/-R, DVD+/-RW, DVD RAM, DVD+/-R Dual Layer, CD-R, CD-RW blank media standards. Intelligent design automatically recognizes the source disc format Duplicator controller automatically formats "User friendly" controller utilizes familiar "ESC" & "ENT" keys with tactile feedback for easy navigation System is upgradeable via firmware Password protection modes prevent unauthorized usage Fast built in memory buffer: 128mb DDr2 ram. Support duplication up to 7 target drives but also work with less drives connected.Compatible with almost all major dvd burners drives. If you have any questions about this product by Copystars, contact us by completing and submitting the form below. If you are looking for a specif part number, please include it with your message.